That RajniCan has sent you a friendship request on Faffbook has not gone down very well with the Lungi Army. The Yell Yay men, as they are fondly known, have taken it upon themselves to get your password and strike friendship with The Invincible themselves. But when you have a friend in the mighty RajniCan, should you worry? Watch him as he takes them one by one… and sometimes a lot more at once! 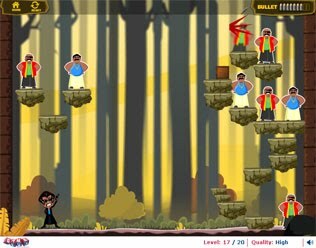 Rajni Minds It is a fun game which displays RajniCan’s special powers and antics to the fullest! It’s a treat to watch how RajniCan flips his revolver and makes his bullets deflect! Place your mouse at an angle and click to shoot. Kill all Yell Yay men in the level to proceed. Grab your RajniCan Protection Medal for making a score of 22000!